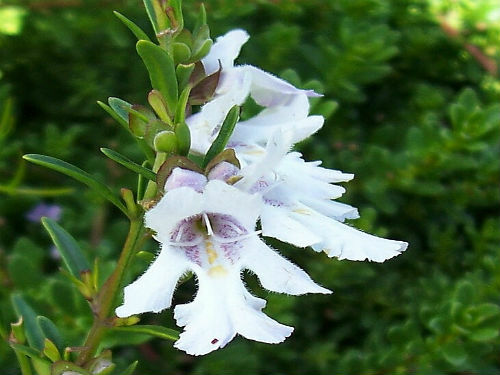 Prostanthera saxicola is a prostrate to erect shrub that may reach a height of 2 metres. Small leaves are crowded to scattered, up to 15 millimetres long, aromatic and covered with white hairs. The flowers are axillary, white to mauve and appear from July to February. Tip pruning, after flowers fade, is appreciated. There are four varieties: var. saxicola, var. bracteolata, var. major and var. montana. P. saxicola var. saxicola is the ground covering variety. There is a cultivar known as “Pigeon Blue” which is a dense ground cover reaching a height of 30 centimetres with a spread of 50 centimetres and is found in a small area south of Sydney. P. saxicola has a wide distribution and is found on the coast, tablelands and slopes of NSW as well as Queensland. “Pigeon Blue” could be grown as a colourful and aromatic ground cover in native garden beds. The species name is from the Latin: saxum meaning rock or boulder and cola meaning dwelling.